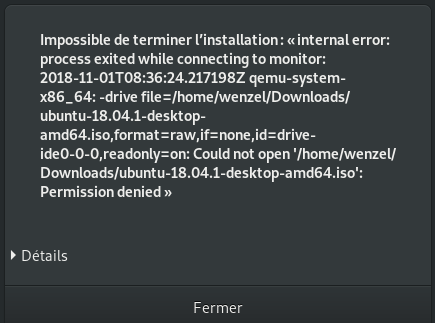 Hi, I'm trying to setup a new VM in virt-manager under Fedora 29, and i always et a permission denied at the end end of the setup, when qemu-system-x86_64 has been started and attempts to access my ISO in /home/wenzel/Downloads/ubuntu-18.04.1-desktop-amd64.iso. in /etc/libvirt/qemu.conf, the default user and group configured are root:root, so root should be able to access this file ? Can somebody help me diagnose the problem ? Thank you ! if you don't want to run in problem across setting ACL to your home directory and qemu config , just copy your ISO image to /var/lib/libvirt/images (and access it from there) all the problems will go away or move the ISO to \tmp directory. and uncomment user="root" and group="root"
thanks, it worked by moving my ISO into /var/lib/libvirt/images. The problem is that i have to keep the qcow there too. Usually i store my VMs in /home/wenzel/kvm I used to do this before, can you explain what has changed in the recent versions of Fedora ? Don't move anything at all. Just add the user to libvirt group. installing latest release of libvirt?